M Sport, 2 Owner, Inline 6 engine, Great price point for an M Sport Package BMW. Comes in the super hard to find Le Mans BLUE! We love this blue and wish it came around more often, especially with a clean carfax west coast. It is extremely hard to find any M Sport package BMW even under $16,500, especially one with a clean carfax and in great condition. The 328i models of the BMW has the signature/bulletproof inline 6 engine in the coupes up until 2013. It has been time tested and proven to be one of the strongest and long running engines of all time. In the 2012 328i sedans and the 2014 428i coupes went to the new 2.0L turbo engine. It seems like every car or small SUV on the market now days have some sort of 2.0T engine. It really takes away from the signature drive and equal power throughout that the inline 6 engine in the BMW's were known for. That is one of the main reasons that we love these year BMW's is because of the engine. The M Sport package is a must for any true BMW lover, and the value you get from the M Sport package you enjoy the whole time of ownership, especially that "M" steering wheel. Getting to hold on to that steering wheel every time you drive is worth the price of admission on its own. The M Sport package also gives you upgraded front and rear bumpers for a more aggressive and stylish look. The "M' wheels are tasteful and really go with the coupe body style perfectly. The upgraded suspension ONLY on the M Sport and Sport models, is much better than the base suspension and once again is what an "actual" ultimate driving machine should feel like. The Le Mans Blue exterior is exotic looking and will turn heads everywhere it goes. The full window tint completes the exterior look of this M Sport. The M steering wheel is one of the best parts of the interior. We cant say enough about it. The M Sport package also give you the premium seating package as well. The seats are totally different than the non sport seats, and have much more bolstering to hold you in for the ultimate driving experience. They also look a million times better than the non-premium seats. All of these 3 series did not have heated seats, this one does! They did not all have the screen with navigation and all the other cool things that you can do on the screen. Not to mention when you buy a luxury car now days, you have to have some sort of screen. Only 53k miles on this car is nothing. With the inline 6 engine, it is just now breaking in. What a fun car to drive. 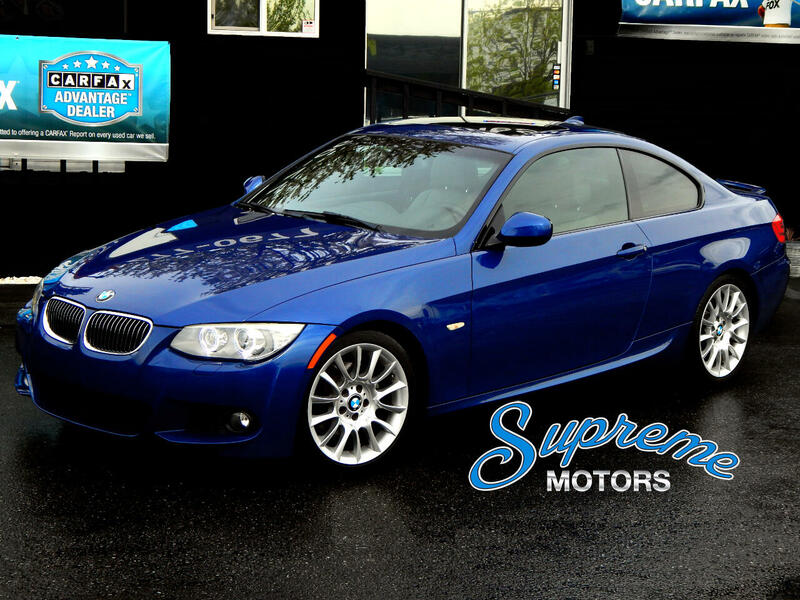 With it being a clean carfax, two OWNER sold as a CPO to the second owner, LOW MILES, M Sport, inline 6 engine, all the right options, and "price Point", this M Sport checks all the boxes and makes it a one of a kind car in the market with all of these attractive attributes "combined." We also offer extended warranties and the 3 series BMW rate very low so they a surprisingly very affordable. It just helps create much more value and makes for a better all around car purchase. call or email with any questions or stop by anytime during our business hours.